Fresh air will fill your lungs, while walking around small river Kamenice will provide a most spectacular scenery. You will feel like in an other-world site. Let’s say it straight – Prague is a great city but summer can be really awful in the brick and concrete capital of the Czech Republic. When these days come, the only way to escape is to go to one of the crowded parks around the city or to leave the city altogether. Even though our country is quite small there are thousands of amazing places close enough to take a day trip to from Prague. 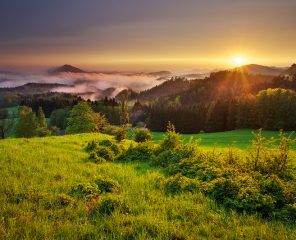 Czech Republic has more to offer than just Prague, so if you want to get a more genuine picture of the country, you simply need to go outside of our precious capital city. 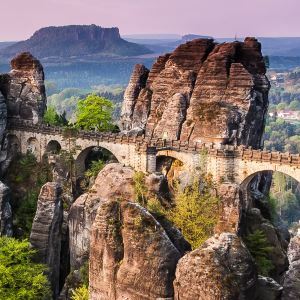 One of the most beautiful hikes (at least in my opinion) near Prague will take you through the Bohemian Switzerland national park . The park was founded in 2000 and is located about an hour and half to the north from Prague. In the summer, the Gorges of Kamenice river is must visit place. 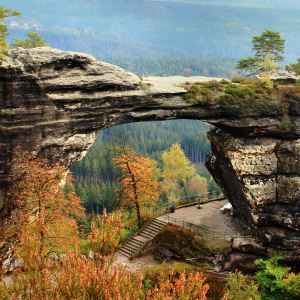 What is so unique about Bohemian Switzerland and the Gorges of Kamenice, you ask? Just imagine there used to be a sea several millions of years ago! The sand from the sea settled at the bottom creating an incredible sandstone towers and other extraordinary shapes which look like from another planet. Currently, it’s a very popular destination for climbers. And thanks to its hard accessibility it used to be a convenient place to build fortresses too. The ruins of some of them are visible even in these days. Remember the stone arch from Chronicles of Narnia? That amazing place is called Pravčická brána and it‘s nowhere else than here, in Bohemian Switzerland. Together with the gorges of Kamenice, it is the most popular place to visit in the national park. If you are into serious hiking, you can visit both highlights in one day. 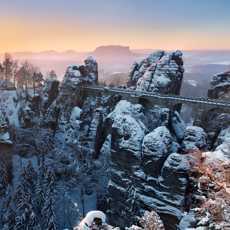 You will have the opportunity to get the most out of the pristine nature of the Bohemian Switzerland National Park. In my opinion, gorges of Kamenice is a must day trip from Prague. They are opened from April to October and sumer days are definitely the best time to visit. Crazy, right? 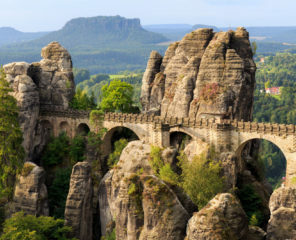 Keep in mind that Bohemian Switzerland is on the northern border of the Czech Republic. Furthermore, the extensive forests and the depth of the gorges make it close to impossible for the heat to get all the way down. Even when people are fainting from heat in Prague, you will need a jacket in the gorges. Kamenice river used to be very important for local people because trouts and salmons living there. At the same time it used to be an impassable obstacle on their way to the church. So with the development of tourism at the end of 19th century, sir Edmund and hundreds of Italian workers built the trail in a difficult rocky environment by the river. The trail is interlaced many tunnels, bridges, caves and resting places. Two parts of the trail are only accessible by boat which started operating in 1890s and became a big attraction since then. One of the gorges was named after Sir Edmund to honor his endeavor. Edmund Gorge (also the Silent Gorge) is the longer of the two gorges and is more popular than the Wild Gorge. 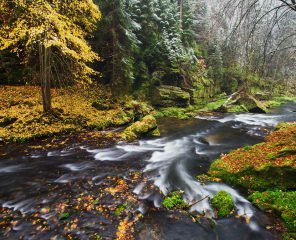 In the Wild gorge you can venture into untouched nature and it is a perfect destination for a short trip from Mezní Louka. If you decide to head there, the path will first take you into the lovely village of Mezná, close to where you can take a short boat ride and then take a walk along the river (mind your head) and back uphill to Mezní Louka with a great choice of restaurants for a typical Czech lunch. If you’re into svíčková or goulash, Restaurant u Fořta is the place for you. Their menu also includes vegetarian options. If you have a great imagination, Edmund gorge will be a treat for you. Just sit back and relax on the boat ride while listening to the boatman’s stories about the fairy tale characters hiding in the cliffs around you. From the waterman who is repairing his shoe, over the longest water snake in the world to the family with an interesting history. I bet you are curious, but I am not going to spoil the surprise for you anymore. Just take a day trip from Prague with Northern Hikes and check it out yourself. Believe me, it’s worth it.